MEOSAR Satellite Ground System In Action - More lives saved. Faster. Greater Efficiency. When someone requires search and rescue (SAR) assistance, every minute counts. In the next few years the world of search and rescue will be revolutionized with MEOSAR, offering near instantaneous signal detection with greater coverage, reliability and location accuracy, ultimately saving even more lives. Cospas-Sarsat The International Cospas-Sarsat Program is a satellite based search and rescue distress alert detection and information distribution system, best known for detecting and locating emergency beacons activated by aircraft, ships and hikers in distress. Since its launch in 1982, Cospas-Sarsat has helped to save over 42,000 lives. Next generation Medium-Earth Orbit (MEOSAR) satellites will pick up the distress signals in near real time with more accuracy, versus the current system that can take as long as two hours. Launching rescue operations sooner with better precision results in faster recoveries for individuals and government agencies and more lives saved. Since the inception of Cospas-Sarsat in 1982, this international cooperative has provided a free-of-charge global search and rescue satellite-aided tracking (SARSAT) system dedicated to saving lives around the world. McMurdo Group, the only provider in the world that offers a full “ecosystem” of SARSAT infrastructure – including distress beacons, satellite communications infrastructure, and search and rescue (SAR) command and control software solutions – has been instrumental in saving more than 42,000 people around the world. Mere seconds can make the difference between life and death in an emergency. Yet today, it can take hours to detect an emergency distress beacon – and even longer to discern a location precise enough to launch a rescue mission. Part of Orolia, a leader in resilient Positioning, Navigation and Timing (PNT) solutions, McMurdo has historically been a pioneer in the pursuit of search and rescue excellence. McMurdo continually develops next-generation innovations that improve detection times and location accuracy, so we can recover lost hours and minutes and get closer to our goal of taking the “search” out of search and rescue. The next step towards this goal? Next generation Medium-Earth Orbit (MEOSAR) satellites will pick up the distress signals in near real time with more accuracy, launching rescue operations sooner with better precision results in faster recoveries for individuals and govenment agencies resulting in more lives saved. Goal: Determine beacon location within 5km, 95% of the time, within 10 minutes. As Cospas-Sarsat is approaching full commissioning of its anticipated 76-satellite MEOSAR network, McMurdo is well underway in installing MEOSAR solutions poised to receive and relay distress signals in real-time with greater accuracy than systems available today. 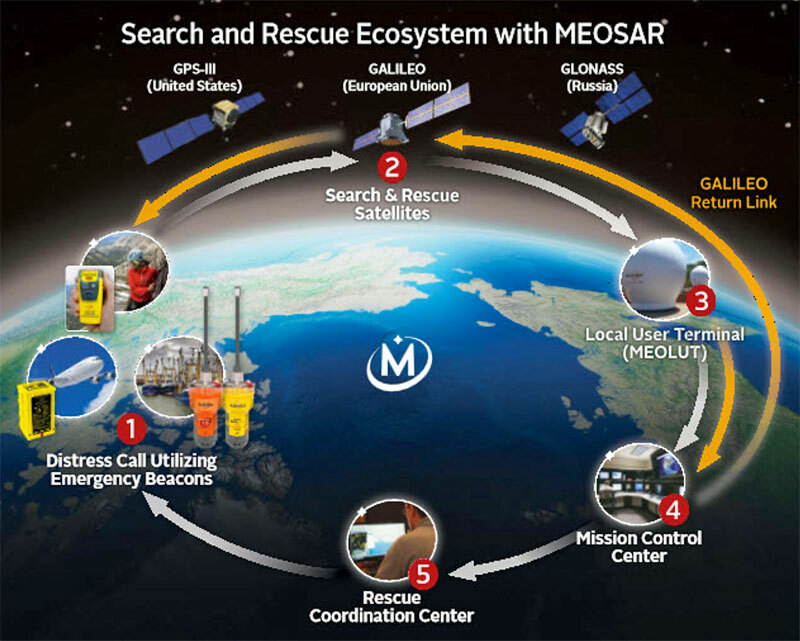 Compared to the current LEO (Low-Earth Orbiting) and GEO (Geostationary Orbiting) systems, which can take up to two hours to detect because of its limited coverage and GPS data, MEOSAR’s near-instantaneous signal detection allows SAR agencies to launch rescue operations sooner and to more precise locations, ultimately resulting in more lives saved. In the domain of search and rescue, the MEOSAR system represents a technological revolution similar to the impact of GPS in the world of radio-navigation in 1995. You’re backpacking alone in rugged terrain. You fall more than 90 feet, break one of your legs and can’t walk. Even your cooking pot is mangled. What’s the best thing you can hope for? For New Zealand’s Don Stevens, it was the distress signal from his personal locator beacon (PLB) relayed by the next-generation MEOSAR satellite system to Rescue Coordination Centre New Zealand in only four minutes—50 minutes sooner than if the existing system picked up the same distress signal. McMurdo was instrumental inthe upgraded Cospas-Sarsat satellite system that found hiker 50 minutes faster than the existing system. Don Stevens, a 53-year-old teacher from Wellington, New Zealand, was hiking over rugged terrain in the Tararua Range when he fell more than 90 feet, breaking his leg and leaving him unable to walk. After he activated his McMurdo FastFind 220 personal locator beacon (PLB), the distress signal was relayed by the MEOSAR satellite system to the Rescue Coordination Centre New Zealand in only four minutes – 50 minutes sooner than the existing system picked up the same distress signal. McMurdo was instrumental in all phases of the rescue, from the McMurdo FastFind 220 PLB to the McMurdo designed and installed MEOSAR satellite ground stations, Mission Control Centers and Rescue Coordination Centers. “The extra time created by receiving the signal faster was invaluable and potentially lifesaving,” said Rescue Coordination Centre New Zealand Manager Mike Hill. In a typical satellite-based search and rescue scenario, ships, aircraft or individuals transmit distress signals from an emergency location beacon via satellite to a fixed ground receiving station or local user terminal. The ground station calculates the location of the distress situation and sends an alert to the appropriate rescue authorities. Today, the beacon-to-alert process depends on a limited number of Low Earth Orbit (LEO) satellites and may take several hours before a position is confirmed. With MEOSAR, beacon signals will be received more quickly and beacon locations identified with greater accuracy thereby reducing this time to minutes. “Beacons can take the ‘search’ out of search and rescue, and the MEOSAR system will dramatically increase the global search and rescue capability,” said Maritime New Zealand Director Keith Manch. McMurdo continues its leadership in implementing MEOSAR systems around the world, and it is gratifying to see the tangible results of our work in New Zealand. A gravely injured person was rescued from a life-threatening situation by activating a McMurdo PLB that was received by a McMurdo MEOSAR system. Real people are being rescued with the help of MEOSAR, and McMurdo is very proud to be part of the many individuals and agencies who have worked tirelessly in the SAR industry to make the vision of MEOSAR become reality. McMurdo has been building and testing MEOSAR-capable beacons and other technologies for years, successfully providing new MEOSAR solutions, as well as upgrading existing LEOSAR and GEOSAR infrastructure to be MEOSAR capable. McMurdo’s innovative, best-of-class transition technologies, rescue agencies maintain full operational SARSAT capacity with current satellites before seamlessly transitioning to MEOSAR capability. They realize tremendous cost benefits by upgrading existing infrastructure rather than having to purchase new equipment and render useless the old. As of March 2017, McMurdo is the global leader for MEOSAR solutions, having installed more than half of the world’s MEOSAR infrastructure, including satellite receivers, ground stations, local user terminals and command and control software for mission control and rescue centers. Aviation, marine and outdoor enthusiasts rely on 406MHz emergency beacons to help with their detection and location in a distress situation around the world. McMurdo is a global leader in emergency readiness and response, working with Cospas-Sarsat and other agencies to define and develop the next generation satellite-based search and rescue ecosystem. From distress beacons to satellite connectivity to SAR infrastructure and rescue operational systems, this knowledge center is your portal to information regarding MEOSAR. As an ‘ASTORS’ competitor, MEOSAR will be competing against the industry’s leading providers of Innovative SAR Satellite Ground Systems. Good luck to MEOSAR on becoming a Winner of the 2017 American Security Today’s Homeland Security Awards Program!